High Flow Commercial . . . The DCM-602 system is ultimate in duct cleaning. This heavy duty system can clean any ductwork. 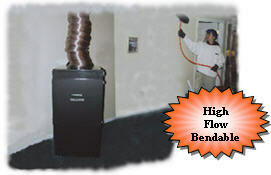 Our High Flow negative air vacuum with the brushing unit is a high performance and portable system. This combination of Brushing w/Air Flushing and high flow negative air thoroughly cleans round, square, flex, etc ductwork. Set the control (DCM-600) to forward position and the brush will clean the right side of rectangle ducts. Put the unit in reverse and the left side of the duct are cleaned as well. 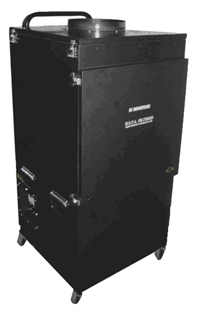 The DCM-5000 is our high flow HEPA vacuum (5000 cfm-free air) and is an Air Scrubber. A single operator can easily clean ducts thoroughly. Dual Purpose "Debris Recovery from Ducts"
What makes our duct cleaning systems better? Unique design breaks static cling of particles on walls and reduces Vacuum CFM. Easier for operator and better scrubbing on walls, including rectangle ducts.